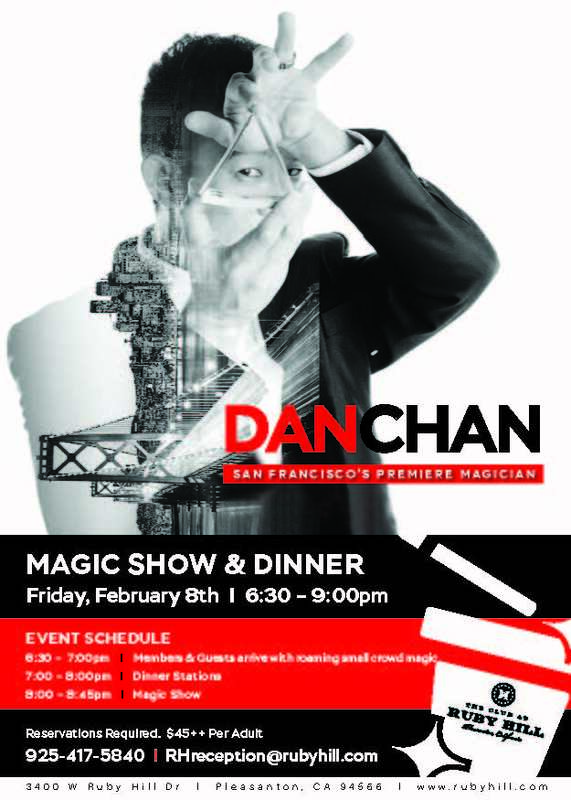 The Club at Ruby Hill is excited to announce a thrilling magic show by Magician Dan Chan. Dan Chan Master Magician is an internationally renowned, award-winning magician whose magic has taken him all over the world. Based in the San Francisco Bay Area, Dan is regarded as the nation's top corporate magician and performs at events for celebrities, thought leaders and influencers worldwide. The Show will take place here at the club in the main dining room. We will have a buffet style dinner with a magic show to follow. Beverages will be available for purchase. Arrive a little early and enjoy private group magic tricks before dinner starts. Magic Show from 8:00-8:45 pm. A second Magic show will be held March 10th that will be for the whole family. Kid Care will be available the night of this event at no additional charge. * 72-hour cancellation policy applies for this event.